Health Care Regulation: Time for a Fundamental Reset? Steven Lewis, President, Access Consulting Ltd.
Why do so many technology projects in healthcare fail? A new framework for studying the non-adoption, abandonment and failure of scale-up, spread and sustainability (NASSS) of health and care technologies. What role does performance information play in securing improvement in healthcare?A conceptual framework for levers of change. Futile treatment and why doctors provide it to patients at the end of life? some empirical findings. Bleeding hearts, profiteers or both? Understanding doctors' fees in an unregulated market. Choosing Wisely – where we came from, where we are going and why we need you. 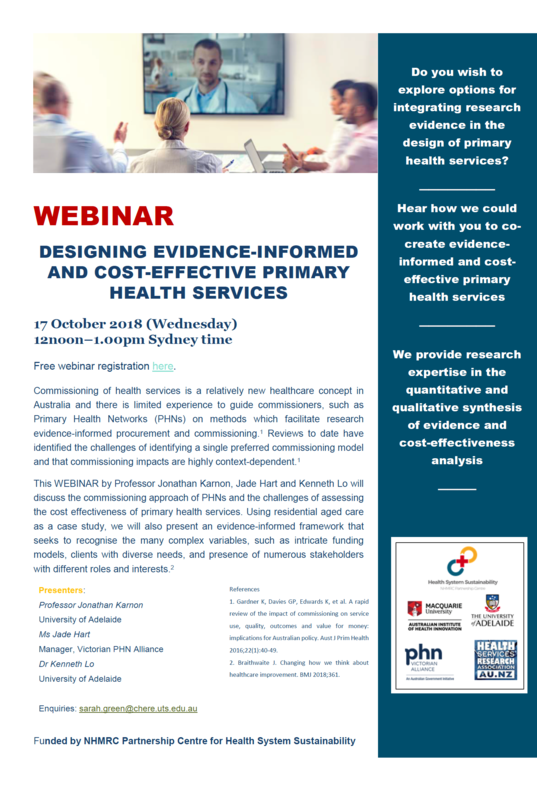 Commissioning health care in Australia – reflecting on Primary Health Networks. Academic-health service partnerships as a translational strategy: panacea or placebo? Social media for health services research: what works and what doesn’t? TWITTER.